Atom Days has an amazing number of multimedia resources on the history of nuclear weapons. New Scientist has a map showing countries with nuclear weapons. The Nobel Committee has a “game” on nuclear proliferation. Radiating Danger: The Spread Of Nuclear Weapons is an interactive from The Washington Post. Nuclear Armed World is an impressive interactive from CBS News. Here is a new Associated Press interactive on the proposed START Treaty. Capturing The Atom Bomb On Film is a New York Times slideshow of some pretty spectacular photography from early atom bomb tests. It’s from The New York Times. 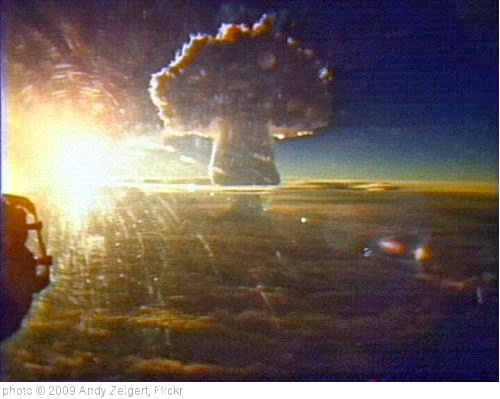 “A Timeline Of Nuclear Disarmament” is a slideshow from TIME Magazine. When We Tested Nuclear Bombs is a series of photos from The Atlantic. Nuking My House On Line (You Can, Too) is from NPR, and tells about a site where you can simulate the damage a nuclear bomb would cause anyplace in the world. America’s nuclear guinea pigs: Astonishing film that shows how Marines were used to test atomic weapons is from The Daily Mail. Interactive: World nuclear club is from Al Jazeera. A ground zero forgotten: The Marshall Islands, once a U.S. nuclear test site, face oblivion again is from The Washington Post. Bomb Blasts is a new interactive tool that – in terrifying detail – lets you see the impact a nuclear bomb blast would have anywhere in the world, including in your neighborhood. It also shares information on how the public can learn more about how to reduce the risk of their use.